It hadn’t taken long to figure out that there really was something or more than one something in the house as Janet had claimed. Lorraine could feel it as soon as she entered. Whatever it was was angry, but she wasn’t sure it was evil. Even if that’s where her mind automatically went. Most of the time the entities that tormented the families she and Ed helped were, if not evil, then at the very least bad, malicious and to be feared. It was angry. She knew that much. But, there was something else mixed in and she couldn’t get a firm reading on what it was. If she had to guess, she would say it was a poltergeist – a ‘noisy ghost’ – doing the damage here because a lot of it was physical. Poltergeists were able to physically move things and to harm the living should they choose to do so. It was one of the reasons they were so dangerous. And so Janet’s concerns that her family was in real physical danger because of whatever she and her friend had contacted was a legitimate one. Offering Ed a subtle nod in response to his questioning look, she confirmed that they were going to do things as they usually did. She would walk the house while he took the family into one of the other rooms to interview them – to get a rundown – on everything that had been happening here. Sometimes they were only able to ramble off several frightening tales that were only half sensical, but sometimes some of the things the family said could be quite useful, even if they didn’t realize that themselves. Watching Ed guide the family away, she turned her attention to the stairs before her. The house was currently quiet, but that didn’t necessarily mean anything. It wasn’t an empty quiet it was more something she wasn’t sure she could put into words. As if something were quietly waiting…For what, she didn’t yet know. Taking a deep breath, she stepped up onto the first stair and began the ascent. About halfway up, she absently reached out to put her hand on the banister, but jerked it back with a hiss as soon as she touched it and was shocked by something akin to static electricity only stronger. Frowning, she looked down at her hand and was only half surprised to see how red it was, as if lightly burned. She didn’t try to touch the railing again, cradling that hand in her other as she continued the climb. She felt wary, jittery…anticipatory. As if something were waiting at the top of the stairs for her, though nothing could be seen. As her foot touched the second floor landing at the top of the stairs, she was both relieved and disappointed when nothing happened. She would rather whatever this was be seen than completely unknown, whatever that might mean for her. It was better to know what you were dealing with than to let your imagination run wild. The first room she came to could only belong to Janet. There were posters on the wall and it clearly belonged to a teenager, though it wasn’t heavily furnished or even particularly messy. A bed rested against one wall, a desk the other. There were books and papers spread across the desk and a cup of sharpened pencils sat on one corner. There were clothes strewn haphazardly here and there and the bed was unmade, but that was it as far as messes were concerned. The windows that covered the wall looking out over the yard had been replaced since the events with the Ouija board and looked obviously newer than the rest of the room. Stepping inside, Lorraine glanced around for any kind of clue that might tell her what was really going on here. Nothing particularly stood out until she spotted the box shoved halfway under the bed. It looked like a game box and she was almost positive she knew what that ‘game’ would be. Jante had claimed her friend had gotten rid of the board after they had used it, wanting nothing more to do with it. It wouldn’t be too surprising if merely shoving it out of sight was her version of ‘getting rid of it.’ She didn’t even think about touching it, knowing full well what it was capable of even without Janet’s stories. There were reasons they constantly tried to tell people not to use such things, though disposing of it properly was probably going to have to be one of the things they did while they were here. Shaking her head slightly, she looked toward the large window again, jumping when the door slammed behind her and turning toward it in surprise. “Hello?” She called out the word, but didn’t honestly think she would get an answer as her pulse sped up just a little. Cocking her head slightly, she listened, not surprised when there was no answer. Nor was she surprised to find the door locked when she tried to open it. She didn’t resort to pounding on it or calling for help. Not yet. Turning back to face the room itself, she tried to make out anything unusual. Any shadows anything out of place…anything. Nothing seemed different, but the pressure in the room had changed slightly and the temperature was beginning to drop. Straining for some sign of what was to come, she jumped again as the lightbulb above her exploded with a loud pop, throwing her arms over her head to protect herself from the glass raining down as the room was plunged into an unnatural darkness that shouldn’t have been possible with the sun shining so brightly outside. Taking an unconscious step backwards, she gasped as her heel came down on something that couldn’t possibly be there, something that clicked and crunched, splintering beneath her shoe with a terrifyingly familiar sound. Freezing where she was, she lowered her arms and deliberately looked anywhere but down, not wanting to see what she knew was there. Swallowing hard, she kept her eyes up as she reached down, knowing she wanted to touch the floor – or what had replaced that simple carpet – even less than she wanted to see it, but doing so anyway. As her hand made contact a moan escaped her throat as her dream was brought back full force. The tombstones, the dark and gritty earth, the bones…the bones. She had known as soon as she stepped on it that this was what it was. She had known by the sounds because she had heard them before. Dropping her gaze, she saw the skull beneath her palm, even in the sudden darkness and then the screams began. Loud and pleading and tortured and angry…a variety of emotions smashing through her head with an intensity that was enough to knock her the rest of the way off her feet and send her crashing into the bones piled beneath her. Unable to do anything to stop her fall, she cringed and lifted her hands to cover her ears just as she had done before, knowing – just as she had before – that it wouldn’t stop the screams. It came out more of a whimper than anything, accompanied by tears of desperation and pain because the screams weren’t just pain filled, but painful. Still they begged for something from her that she couldn’t provide, that she couldn’t figure out. Just when she was certain that she couldn’t take it anymore and was ready to let a different kind of darkness take her, the screams stopped. Cut off as if they had never existed at all. After a long moment, she slowly lowered her hands and opened her eyes. The room was no longer plunged into a seemingly bottomless darkness, but lightened by the sun outside. She sat on the old fashioned carpet with nothing but the glass from the broken bulb around her. A sound like hands slapping glass made her gaze slowly move toward the window. 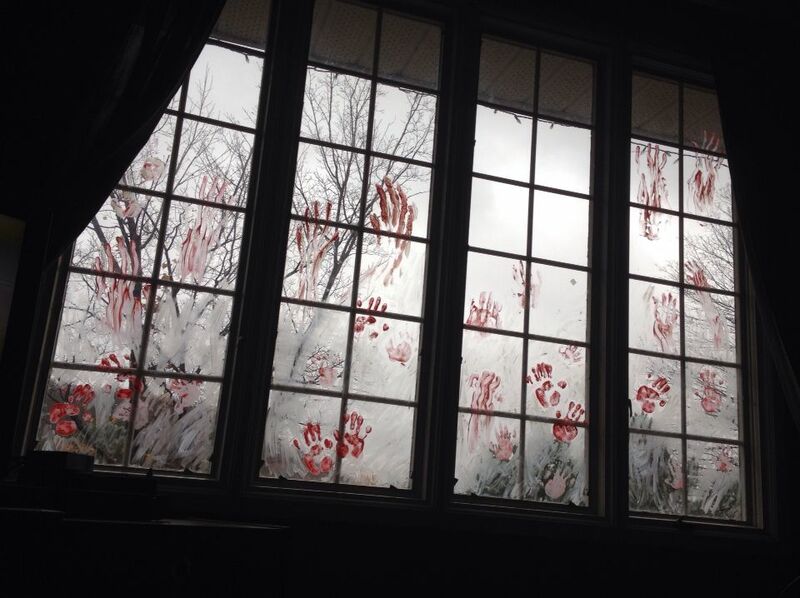 A handprint stood out in stark contrast to the clean glass. A red handprint that looked eerily like blood. As she watched, the sound repeated several times, a handprint appearing each time. Different sizes and shapes, as if they belonged to several people, hitting the window in desperation from the outside. Then they were gone. Just like that, everything was gone and she sat alone in the brightly lit room of a teenager who had come to her for help with something that was haunting her house. Alone with something that scared her like nothing much did and still no idea what to do about it. She didn’t remember walking back down the stairs and was surprised to find herself standing in the door way of the kitchen where Ed still sat with the family as if nothing at all had happened upstairs. But, maybe for them it hadn’t. All eyes turned toward her, surprised at her appearance – pale and disheveled with glass in her hair and an almost vacant expression on her face. She saw Ed’s lips move, thought maybe he was speaking her name, but as she opened her mouth to reply, no sound came out. Instead that darkness she had refused began to creep over her and she felt her legs give out beneath her. She vaguely heard Ed’s voice as she fell, but the darkness was stronger and soon that was all she knew as she collapsed in a heap in the doorway.